A day in the life of Jason Derulo is anything but straight forward. Jason Derulo reunites with a lover on stage in front of thousands in the video for new single "Goodbye." 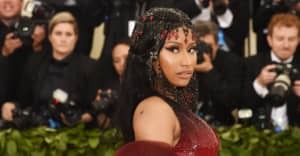 The David Guetta-produced track also features guest artists Willy William and Nicki Minaj comparing herself to "A mermaid ting and he wanna swim" in a series of eye-catching outfits. The majority of the action, however, is focused on Derulo's love story. He and his partner wake up together but are soon separated. The pair long for one another throughout the day, including two heartbreaking party and dinner scenes. A series of missed opportunities follow before they finally embrace at a tour stop in Europe. The visual is a bright and romantic accompaniment to the song that aims to restore your faith in love. Check it out above.